The video below shows a difficult epoxy grinding job on hard concrete and a wavy floor after the standup grinder had already failed to remove most of it. Floor grinding in this way requires less effort because body weight is transferred from the knees to a chair and mobility is enhanced compared to working from the kneeling position. The Situp Grinder kit consists of a welded steel frame and mounting bracket, fasteners to secure it to the grinder, a sliding side handle for left or right handed operation, a weight holding tube, trigger switch mechanism, Hybrid dust shroud and economy 12 segment turbo grinding wheel. Edge grinding of concrete floors is smoother and faster with more control of the grinding wheel. Concrete floor grinding can be performed with much less effort even when removing glue or coatings. 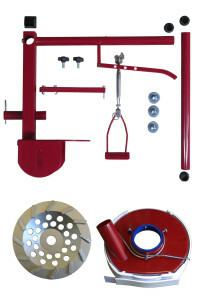 The Situp Grinder kit transforms an angle grinder into an excellent floor grinder and floor edge grinder and is ideal for the small operator who needs to get the job done quickly without the expense of a larger floor grinder. For large jobs it will cut down the edge grinding times and does not require as much downtime because fatigue is substantially reduced. As a floor edger it is easier to control than a handgrinder used while kneeling, it is faster to move along walls and will help to eliminate the slow edge grinding process.